I’m not as obsessive about bikes as some other riders that I know, but I have gone through my fair share of rides in the past 30 years or so. Here’s a rundown of all the bikes I’ve owned in my life. My earliest biking memories start around the time my parents presented me with a shiny red banana-seat bicycle with hanger-style handle bars on my birthday in the early 80’s, and I rode that thing until the wheels fell off. Never mind the fact that I really wanted a BMX bike instead – that bike and I were inseparable. I rode that thing hard for the next few years, but the relationship ended in 1986 or so when my parents surprised my sister and I with matching mountain bikes from Kmart. The red banana-seat bike had been relegated to storage (never to be ridden again), and it felt good to be riding a “real” grown up 10-speed. I became obsessed with freestyle BMX tricks and stunts in the late 1980’s, but I was never able to convince my parents to spend the money on a real freestyle bike like all my friends had. The ultimate bike for me at that time was a pink and white GT Performer, but my parents considered bikes like that a waste of money. They were generous enough to buy me a freestyle bike, but it came from Kmart (their favorite place to buy bicycles) and it was a total piece of crap. I stripped the headset within a matter of weeks trying to learn the tricks I saw in VHS videos and Freestylin’ magazine, so most of my allowance was spent on bike parts in order to keep that thing in decent shape. My love of bike riding diminished quickly after I got my drivers license at the age of 16, and I didn’t get the itch to ride again until my sophomore year of college in Detroit, MI. Several of my friends at the time had really nice mountain bikes that they rode all over campus (and beyond), and I quickly became jealous of their adventures. 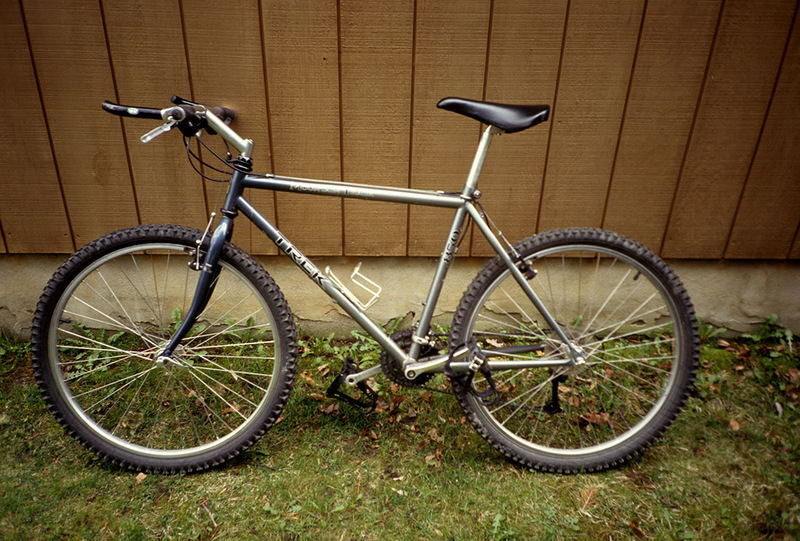 I ended up buying my first “real” bike (a Trek 850) the summer between my sophomore and senior year (1995), and I quickly came to realize how much I enjoyed the freedom of being on a bike. I put thousands of miles on that Trek over the next year or so, and in 1996 (now living in Dayton, OH) I decided to upgrade to something more substantial: a Trek 7000. Oversize-diameter frames were just becoming popular at the time, and I loved the way the way this bike looked. 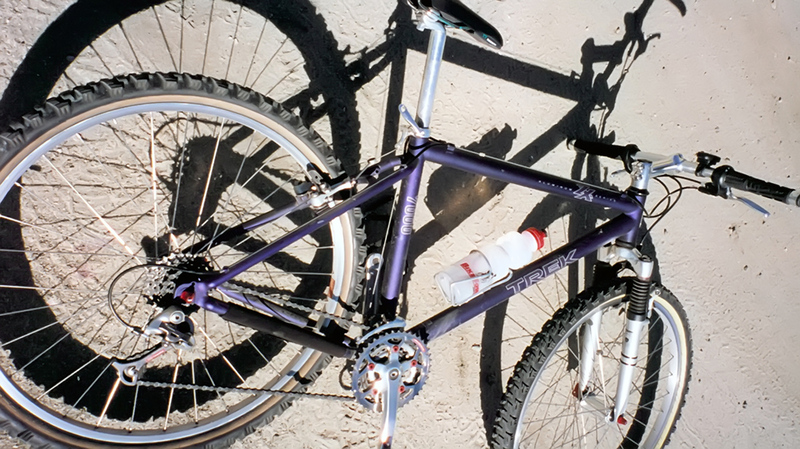 The satin purple color on that thick frame was really unique, and I rode that thing hard all over Dayton. I was more of an urban rider at that time, heading off after work and on weekends to bomb around the city and up and down unknown streets. Trail riding was rare for me – there weren’t many good trails around Dayton (at least that I was aware of), and the fact of the matter is that I didn’t really enjoy getting dirty. I moved to San Diego in late 1997 with that Trek 7000, and my love for biking exploded. 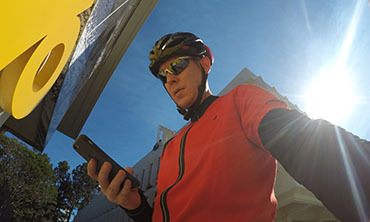 Riding in San Diego was like nothing I had ever experienced before. The trails were amazing, the urban riding was much better than Dayton, and I was always discovering new and exciting places to ride. My favorite at that time was the dirt fire roads in the Black Mountain area (near Rancho Bernardo and Poway). The hills were a real struggle for this skinny midwestern boy with weak leg muscles, but my weekend afternoons in late 1997 and 1998 were spent out there riding and exploring the beautiful landscape. Unfortunately, that area has been built up and is all residential now. Those old fire roads are long gone. In the fall of 2000 I couldn’t resist the urge to upgrade my aging 7000 to the latest model. Never mind the fact that I was working for a struggling startup at the time and didn’t really have any extra money to be wasting on a bike, but I did it anyway. It was another Trek 7000, but this one was yellow. I rode this bike hard for the next 7 years, burning through multiple sets of tires, countess tubes, and lots of other parts. I took it to Big Bear Mountain here in southern California twice for fast and steep downhill rides, and it came with me when I temporarily moved back to Michigan in mid 2001. 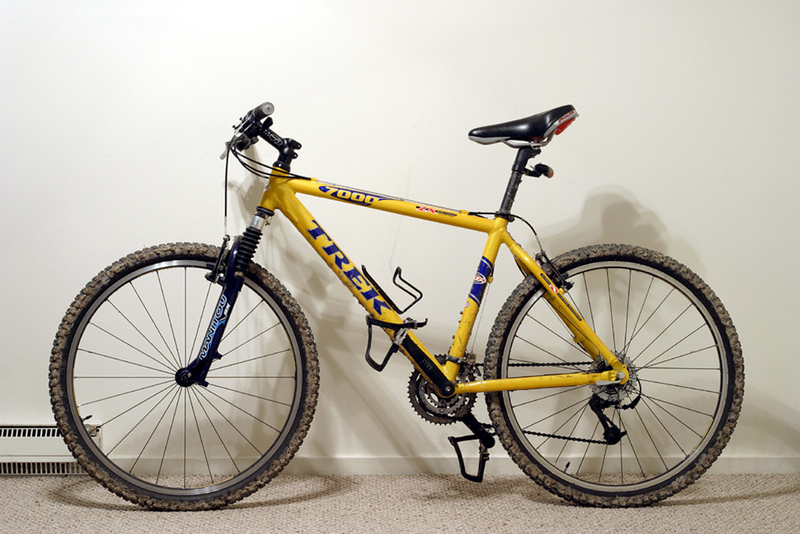 By early 2007 (and back in San Diego), I had been using my trusty ‘ol Trek 7000 for multiple purposes: trail riding, road riding, and commuting. Trail riding is hard on a bike, causing it to fall out of tune quickly. Therefore, using it for commuting or road riding purposes right after a hard trail ride was quickly becoming unbearable. It was constantly dirty and squeaky, two things that annoy the crap out of me while riding on the road. It was time to solve this problem. The solution, of course, was a dedicated road bike. The thought of having one bike that would remain clean and in-tune (while I continue to trail ride the 7000) was mind-blowing to me. It was my first time owning two bikes simultaneously, and it felt so liberating! That new road bike was a 2007 Specialized Allez Comp, and to say that it felt like sports car compared to my trusty old Trek 7000 is an understatement. Even though it was considered an entry-level road bike, it was a lot lighter and much more nimble than any other bike I had ridden in my life, and it totally reset my perception about biking in general. It was a completely new way of riding: clipless pedals, special shoes, and…those shorts. Yeah, it took me about a year to feel couragous enough to wear spandex out in public for the first time, but it was another eye-opening experience once I did it. It looks so wrong, but it feels so right. My first road bike! 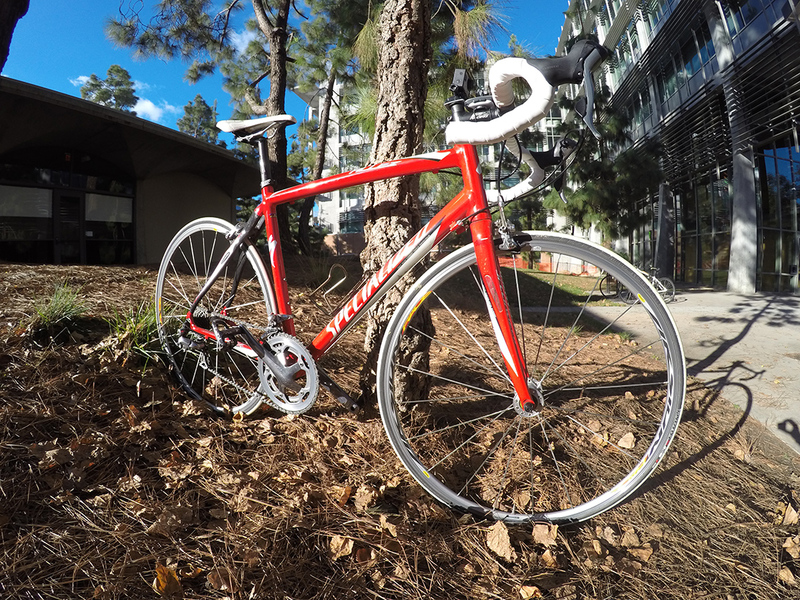 A red 2007 Specialized Allez Comp. in early 2009, I was starting to feel a bit of frustration with my bike situation once again. The reason why I purchased the Allez back in 2007 was to separate my road riding from my trail riding, but the truth is that I didn’t feel comfortable commuting with it. It was too nice of a bike to be left outside and locked up (in public) on a bike rack, so I found myself commuting with my perpetually-dirty and horribly out of tune 7000 instead. I needed another bike – one for each type of riding that I was doing. I started to think about getting a new mountain bike and using the 7000 as my cheap commuter. The only issue being that I had a hard time spending a ton of money on a bike only to trash it on the trails. I’m just not wired that way! 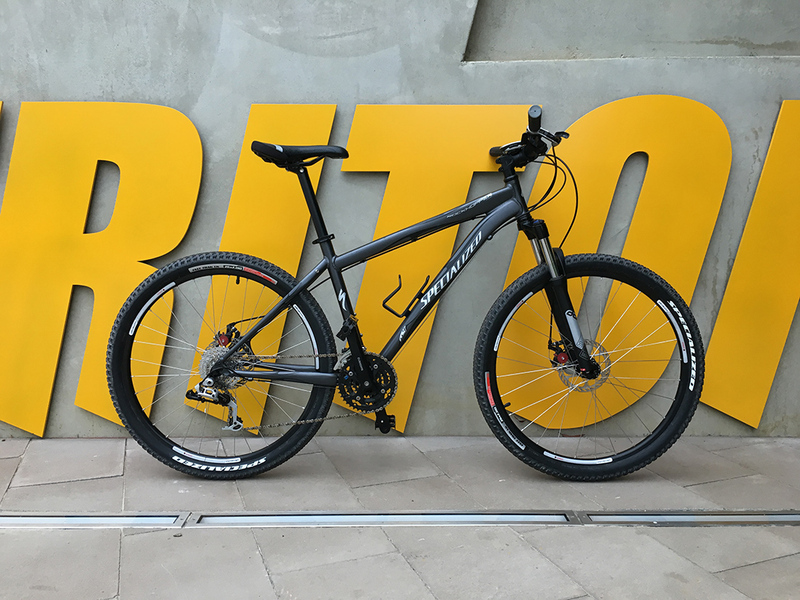 Anyway, I compromised a bit and decided to be conservative with the purchase, and I ended up with a Specialized Rockhopper Comp. Finally, a dedicated mountain bike: my 2009 Specialized Rockhopper Comp. So now I had two new bikes, and a ratty old commuter. I couldn’t stand riding an old bike like that, so two months later I decided to build something to replace the 7000. It would be cheap, reliable, and perfectly set up for my riding style. I had never built a bike in my life up until this point, so I was looking forward to this exciting project! Long story short, I ended up spending way too much money on that custom build – even more than what I paid for my Specialized Allez! 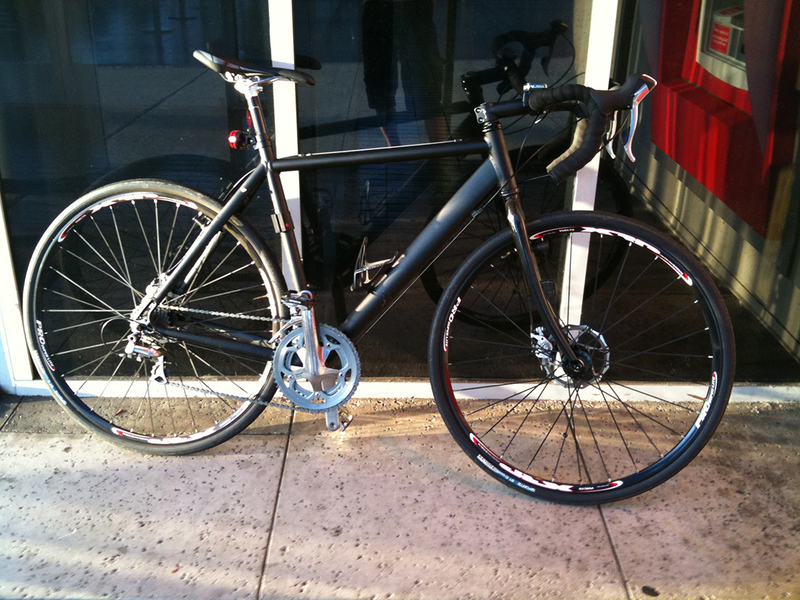 But I had built it to be the perfect commuter for my needs, which meant that it wasn’t a road bike or a mountain bike. It really bothered me that I spent too much money on it, but I just said “screw it” and decided to use it as a commuter that I could lock up in public anyway. My first ever custom built bike: a cross bike with a flat black Nashbar frame.